1. GET A QUOTE: Send us a picture of your furniture through our Quote Form or email directly at albert@bettertex.com – we usually answer the same day! 3. SCHEDULE A MEASURING: Our slipcover specialist will come out and take exact measurements to cut for a fitted slipcover that will fit your sofa perfectly. We also deliver and fit the cover perfectly. 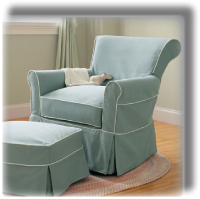 "Fitted Slipcovers just work" Our custom slipcovers involve the process of making a unique cover for ANY furniture. These slipcovers are fitted and have the presence of an upholstery feeling, without the upholstery cost. They are very efficient covers that can be made in the loose shabby chic feeling or an incredibly fitted feeling where you can’t even tell it’s a cover! In the slipcover department, our company works and is the exclusive authorized custom slipcover maker with some of the top European furniture companies in the world. 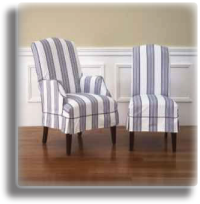 We are proud to provide their furniture with the professional slipcovers for their NYC customers. How Getting a Custom Slipcover works: The first step in creating a slipcover is to have the right fabric that works. Finding the right fabric can sometimes be tough, that’s why at Bettertex Interiors we have fabric specialists at our showroom dedicated to help you find that special fabric. Once the fabric is chosen we are half way there; then, one of our slipcover cutters will take the chosen fabric and take precise measurements of the furniture. At our workshop, we cut the fabric and create your own custom slipcover according to the specifications. To make things even easier, We even deliver and install the cover! Take the first step toward a custom slipcover: For a quote on any custom slipcover work, be sure to fill out our Free Estimate online. Please visit our Slipcover Gallery for samples of our work.